In this article, we will study the process of making a Windows 8 application (Calculator) using C#/XAML. First step is to click the Menu. Then click on tools. In tools, open Options. Finally click on Environment, then general and at the last click on Color theme. Firstly click on File. Then click on New. After clicking New, click on Project and then Templates. The last step is to click on Visual C#. After this click on Windows store and then Blank App (XAML). Let us name the file as “Calculator”. The first is the MainPage.xaml. 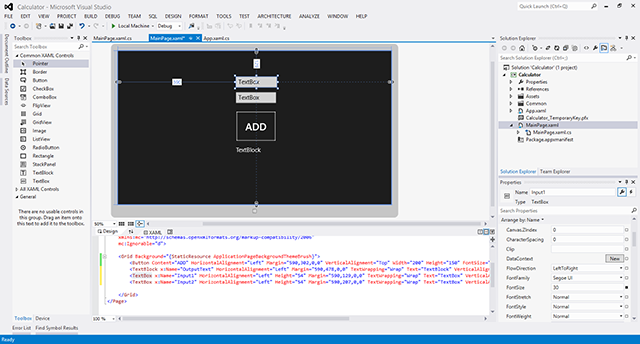 It is the XAML code for the interface. It works like HTML and allows the user to specify the location and properties of things such as buttons, menus, etc. 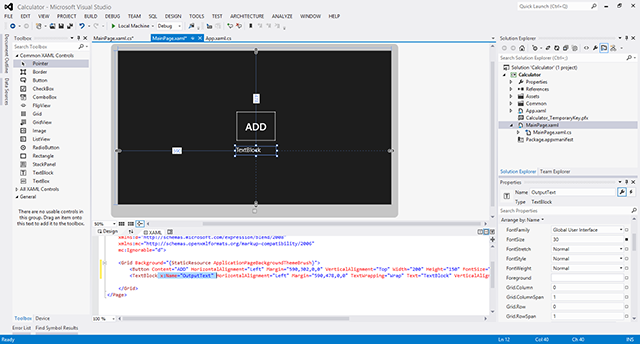 The second file is MainPage.xaml.cs which is the actual code for the project. It is used when the user interacts with the interface. In order to open the editor for the interface, we need to double click on the first file. Then the next step is to check the Toolbox which is located on the left side of the screen. This toolbox contains useful "controls", interface elements that are premade for the user. The first change is made in width and height which are changes to 200 and 150 respectively. The font size is also changed to 50. The last change is made in the content. It is changed to ADD. The next step is to add a control which will display the outputs of the calculations that are made in the calculator. This purpose is served by using TextBLOCK. For this, we need to drag a textblock from the centre and place it under the button. The properties of this block can also be changed and it is named as Output Text. 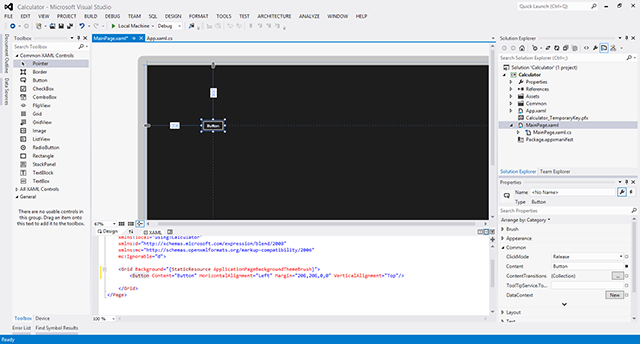 Now under the interface editor, there will be code which is added automatically. The code varies for different users depending upon the changes that are made by them in the properties. After this, the user needs to click on the button in the interface editor. Clicking the button in the control, will create a function in the code editor. Finally before creating the calculator, the user needs to check the button by making the overused cliche, ‘Hello World’. The code should not be copy-paste because if the code is written by the user then the Visual Studio suggests auto completion which is quite helpful in removing little errors. This feature is called Intellisense, which, in this case, brings up all the properties of a given object - OutputText. The first and the simplest option is to click F5. The second is to click on the green arrow button in the menu which is named as Local Machine. NOTE: To exit from the application and return to the desktop, we need to terminate the application by clicking on the red square. If this is not done, then the application is still running and the user cannot make code changes. Now, let us make the calculator from the development which we have done till now. In order to do this, the user has to enter two numbers. Then, he/she has to drag the textbox from the toolbar to the editor and name it as Input -1 and Input – 2. The properties of these text boxes can be changed if required. The last and the final step is to change the code for Button_Click_1. The user need to enter text in the two textboxes. If the user wants to add numbers, so he/she will convert the input to numbers, add them, and convert it back to text again, using the build in "Convert" functions. Finally, run the applications to make calculations! In this article, we studies about the process of using Visual Studio 12 and Windows 8 APIs to create a calculator. This article also teaches us the basic concept for most of the Windows 8 applications.